Compare prices from multiple car hire suppliers in Ilha Terceira to find the best available deal. A few of the car rental companies we compare include Gold Car, Budget, Avis, Hertz, Sixt and many more. Ilha Terceira is a beautiful island in the Azores off the coast of Portugal. It is one of the largest islands, boasting a population of 56,000 inhabitants (2011) and is 396.75 square kilometers in size. It is home to the oldest city in the Azores and a UNESCO World Heritage Site – Angra do Heroismo. Things to see here include the castelo de Sa Joao Baptista do Monte Brasil, the Old Square, and a number of religious buildings. There is one major beach on the island – Praia de Vitoria. While it is rather small, it is a popular local hangout. Also popular are the bullfights on the island. Many people visit the volcanic caves which have been naturally formed. These caves include the Gruta do Natal and the Algar do Carvao. 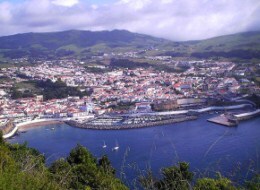 Ilha Terceira is serviced by the Lajes Field Airport (TER), also known as the Lajes Air Base. It is located 12.02 kilometers from Ilha Terceira. It is actually a multipurpose air field, providing home to not only a regional air passenger terminal, but also the Portuguese Airforce and a United States Air Force detachment base. SATA International and TAP Portugal offers daily flights to Lajes Field from the airport in Lisbon, and there are a number of airlines that offer seasonal charter flights, including Air Transat, Arkefly, and Thomas Cook.